This evening saw a bit of a Dads Army moment. The Netduino would not talk to me or my laptop. There I sat with a brilliant idea for a new project and the little devil just looked at me. Had I killed the hardware with static? 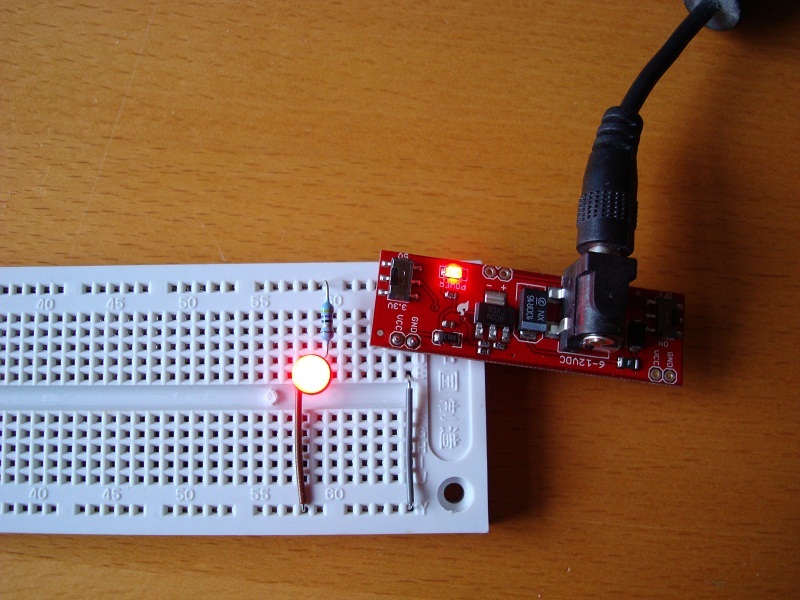 A quick basic onboard LED program written, compiled and YES – deployed. Phew… Now what was that brilliant idea again? Drat, so worried I forgot it. And if you are interested, the original article can be found here. Whilst digging around the components I had ordered I found the digital temperature sensor break out boardI had ordered late last year. I feel a minor enhancement to the LCD project coming on. 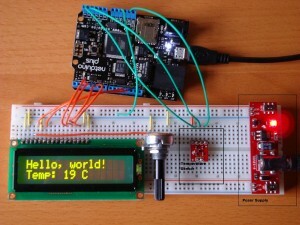 Add the temperature sensor to the project and display the temperature on the LCD. Wiring up the additional hardware is relatively straight forward as we only need four additional connections. I was also helped greatly by Rick Winscot’s post on the Netduino forums. Rick’s post not only contained a class for the temperature sensor but also some helpful comments which gave the wiring to be used. I did make one slight change to the TMP102 class. The GetTemperature method as originally posted returned “0” if there was a problem reading the temperature. 0oC is within the range of the sensor and so I decided to return null for an invalid reading. Comparing the output with the digital output on the central heating thermostat gives a difference of about two degrees. As for the title, well adding the component prices together gives a cost of approximately £80 for this project when there are perfectly good digital thermometers out there for about £10. But where’s the fun in that! As already noted, this project was helped greatly by Rick Winscot’s posting on the Netduino forums – Thanks for donating the code to the community. This week I decided to move my attention to displaying data from the Netduino. Whilst you can use Debug.Print statements to display data on the PC it defeats the object o0f having a micro controller if you have to have it hooked up to a PC in order to see what it is doing. So I decided to purchase a 16 character by 2 line LCD display like the one found here– in fact this is the one I purchased. 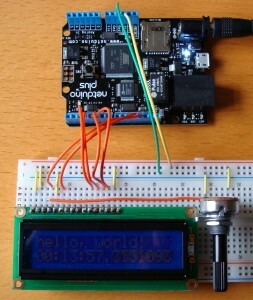 Hook up theNetduinoto the LCD display and show a message to the user. A little bit of internet searching and I found a site discussing connecting this device to the Arduino to this type of device along with some code. 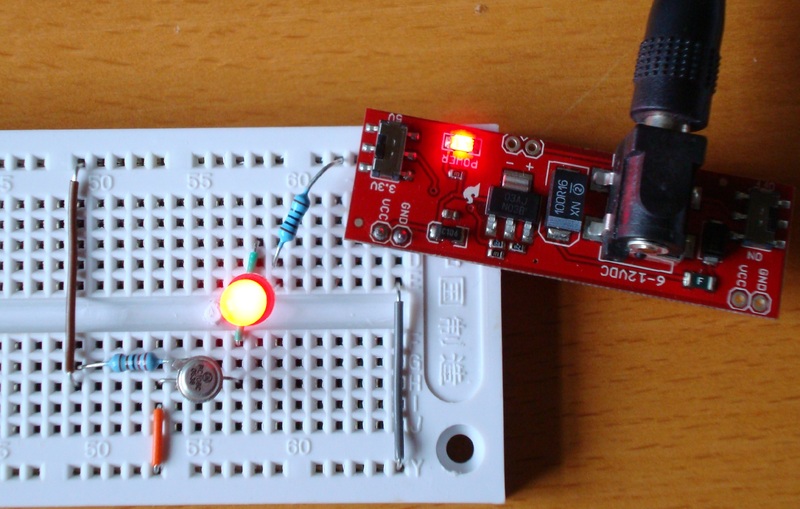 After a little more searching I found this blog by Szymon Kobalczyk discussing interfacing these types of devices to the Netduino using shift registers. Interestingly, he has published a library on Codeplex (Micro Crystal Library) which allows the control of these devices by the Netduino. Sounded perfect. 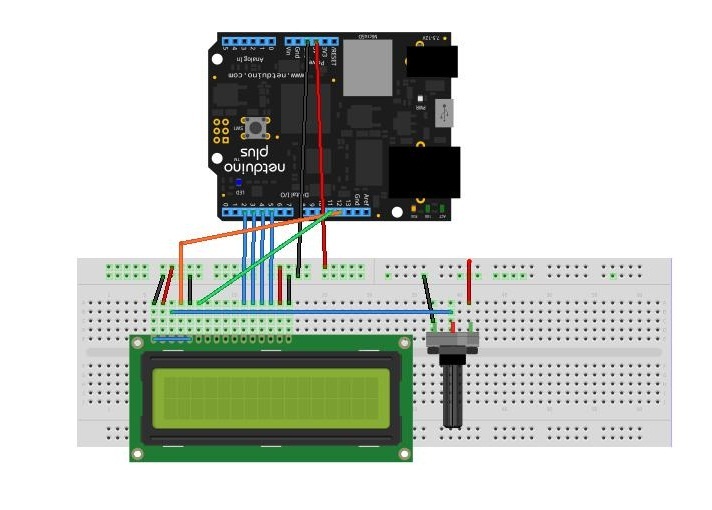 Szymon’s blog post discusses the use of shift registers to control the LCD display. This makes it possible to reduce the number of outputs required in order to control the display. At the moment I am just concerned with displaying data. Optimisation of the number and type of ports will come later. For some reason, the initial run of the project did not function as expected. For a while I was sitting there looking at a blank display. Playing around with the potentiometer did not correct the problem. At some point I disconnected the backlight and again tried to change the contrast and a few dim letters appeared. A little more playing and I soon had a working display with the backlight working. 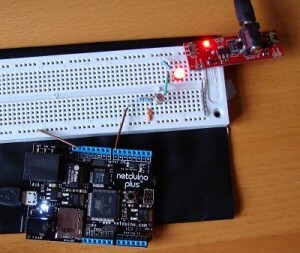 The image above shows the application running without the backlight connected. One further enhancement would be to use the transistor as a switch idea to allow the back light to be controlled from the software. 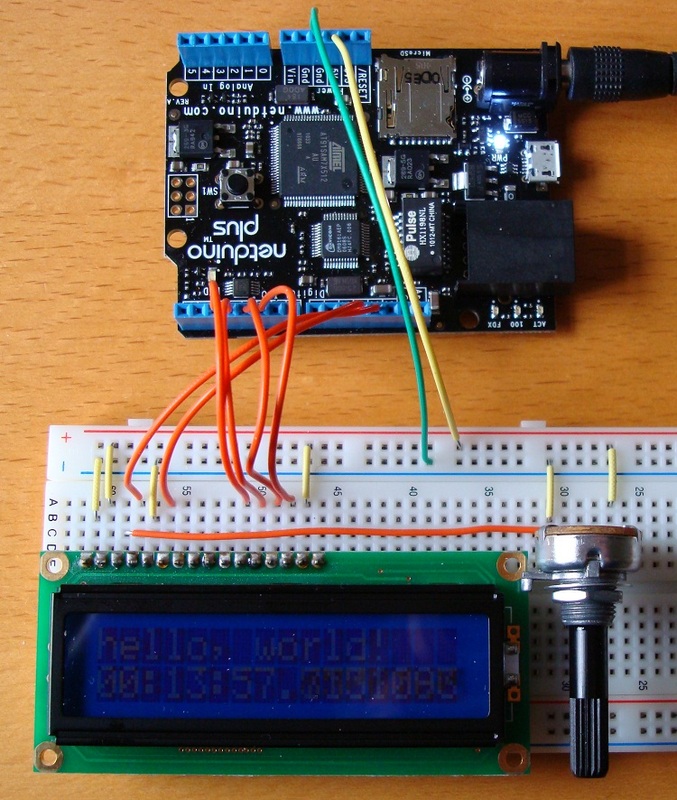 And the next step is to follow Szymon’s blog to reduce the number of pins required. But first a trip to Farnell’sweb site for some parts. In my previous post I mentioned that I was working towards controlling a LED from the Netduino. In fact the aim is to be able to control more than an LED but this is a start. Step two is to use a transistor to control the LED by using the transistor as a switch. By doing this I hope to be able to use this knowledge to control other devices which draw more current than the Netduino can supply (i.e. motors etc.). The aim of this experiment is to control the circuit in the simple LED experiment using a transistor as a switch. The LED should light when the input to the transistor is high and the LED should turn off when the input to the transistor is low. 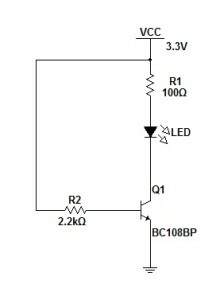 The circuit should draw as little current as possible in order to switch the LED on in order that the switch can be used by the Netduino Plus. Note that the current limiting resistor for the LED circuit has been change to 100 ohms (as opposed to 47 ohms in the previous post). The resistor R2 is used to drive the transistor. By breaking the connection we turn the transistor off and hence turn the LED off. By restoring the connection we turn the transistor back on and hence turn the LED on. The value of R2 has been chosen to provide a very small current to the base of the transistor. This falls well below the maximum current of 8 mA per pin provided by the Netduino Plus. The transistors minimum current gain (hFE) should be at least five times the current being driven through the load (Ic) divided by the maximum output from the chip driving the switch (i.e. from the Netduino Plus). The next step is to calculate the value for the resistor placed between the base of the transistor and the switching current. The value for RB was set to 3k3 ohms. The next stage of the project is to connect this to the Netduino Plus and use this to turn the LED on / off preferably without burning it out :). The reason for taking this slowly is the Netduino Plus can only supply a small amount of current and I’m taking care to draw as little current as possible whilst still having a usable project. The design is simple (I’m not taxing myself too much) and requires little more knowledge that that provided by the LED data sheet and Ohms Law. The task is to use a stable 3.3V power supply and use this to light up a red LED. Minor complication here, I don’t have the datasheet for the LED so I’m not sure how much current it will take. A quick search on Google provides a whole list of web sites with information on LEDs and the consensus of opinion is that modern red LEDs draw about 20mA max and have a typical voltage drop of around 2.5V (along with one comment that burning LEDs make a rather unpleasant smell). Note 8 Jan 2011: Finally found the data sheet for the red LED being used and Vf = 2.5V and If = 20 mA. Armed with this information I need to include a series resistor in the circuit to take the additional voltage drop and limit the current. The power supply itself will come from a breadboard power supply stick from Cool Components. First job is to solder a couple of male header row connectors to the power supply to make it easier to connect to the power supply to the breadboard. Next add the resistor and the LED and plug it all in. The good news is it didn’t go bang and no hint of the smell of burning LEDs. In fact it worked, one glowing red LED. The power supply is in fact delivering 3.25V and not the rated 3.3V. The voltage drop over the series resistor was 1.25V which means the circuit is drawing 26mA and the voltage drop across the LED is in fact only 2V. All in all a small and simple first step.